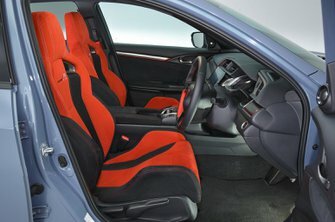 Honda Civic Type R Performance, Engine, Ride, Handling | What Car? If the looks haven’t persuaded you, be in no doubt that this is a car that's seriously intent on the pursuit of speed. Even if the engine isn’t quite a match for, say, the BMW M140i’s 3.0-litre unit, the Civic feels almost as quick accelerating through the gears and is noticeably faster than rivals such as the Hyundai i30N and Renault Mégane RS. And this is an engine that’s keen to rev, zinging round to 7000rpm with a well-oiled smoothness. But there’s plenty of useful grunt in the mid-range, too, so it’ll pull handsomely from 50-60mph in sixth when you can’t be bothered to drop a gear to build speed on the motorway. Having said that, the Civic has a gearchange to savour. The lever almost falls into the next gear with a mechanical alacrity that its rivals – even the premium-badged M140i – cannot equal. If the road is wet and you gun the accelerator away from the traffic lights or out of tight hairpin bends, the front-wheel-drive Civic will struggle to put its power down as effectively as the four-wheel-drive Volkswagen Golf R. Nevertheless, its clever limited-slip differential does an impressive job of distributing power to whichever wheel can cope with it best, dragging you out of turns with impressive speed and stability, especially compared with the softer-edged Golf. 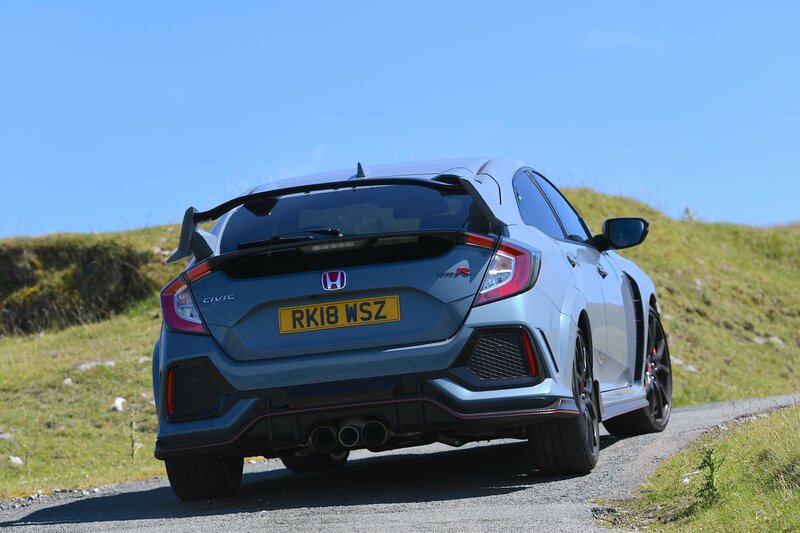 However, despite its suggestive triple-exit exhaust, the Civic sounds a wee bit clinical compared with its European rivals. The whooshing sound it makes when you accelerate hard is slightly reminiscent of a Boeing 747 during take-off; it leaves you in no doubt that lots of power is being produced, but doesn’t really tickle the soul. The steering isn’t blessed with masses of feedback, so it doesn’t chatter in the palm of your hands streaming every detail of the road surface and grip levels available, but that’s true of most rivals. What it does do is allow you to place the car on the road with pinpoint precision – even at seriously high speeds. Although the Civic’s steering is impossible to fault for accuracy, in Sport and +R mode it’s too heavy. The weighting in Comfort mode is spot on, but because you can’t mix and match the drive settings, as you can in the i30N, that leaves you with the suspension and engine response in their most relaxed settings – not what you want for fast driving. Comfort mode is ideal for rougher UK roads, though, allowing the Civic to smooth out lumps and ruts as effectively as many regular hatchbacks; you’re certainly far less ruffled at a journey’s end than you would be in the wearingly firm Mégane with its optional Cup chassis. Comfort mode still provides decent body control, but to keep the Civic truly tied down and minimise body lean, flick it to Sport. This doesn’t ruin the ride, although you feel a little more impact from undulations, but the trade-off is superb agility. 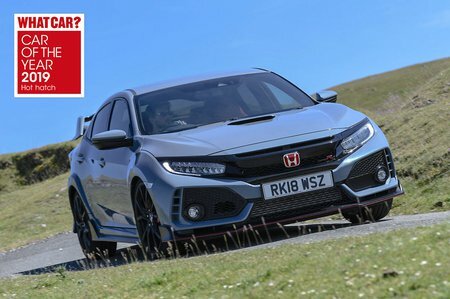 Meanwhile, +R mode is a bit too firm for all but the smoothest Tarmac, making it best left for attacking Silverstone on a track day – something that’s well worth experiencing in such a rewarding and well-balanced car. At speed, the Civic feels utterly planted – pointing to Honda’s claims of downforce being true – and when you need to shed that momentum the brakes play their part; the middle pedal comes with a confidence-inspiring firmness to match its effectiveness. Mind you, there are quieter motorway cruisers; the engine never fully shuts up and there’s lots of tyre roar.